Today we are going to talk about happiness. We all like feeling happy, right? Well, if you don’t like feeling happy, you either need some professional help, which I hope you get, or you’re a freak! But why do we always focus on the negative? Well, our brains evolved this way. It’s an ancient survival mechanism, actually. We needed to learn quickly from bad experiences. This obsession with the negative continues even until today, though we don’t need this as a survival mechanism anymore. 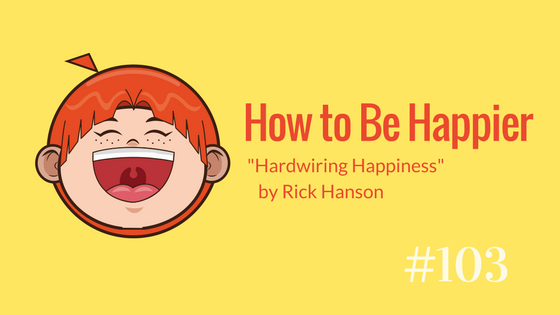 In the book, “Hardwiring Happiness” by Rick Hanson, we learn why we are prone to, (have the tendency to, inclined to) worry about the past, focus on fears, and past hurts, and quite often, ignore positive experiences. *instead of taking the expression “nothing would make me happier” figuratively, the husband took it literally and bought her NOTHING. If you’d like to buy the book or digital book, click here. You can also get the audiobook for free with an Audible trial. Get the audio book here.